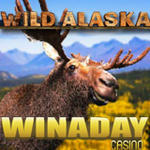 LONDON, ENGLAND, December 13, 2012 – WinADay Casino takes players to the northern wilderness with its new Wild Alaska slots game. The new game is generous with free spins and multiplies wins 3x in its bonus rounds. A 50% deposit bonus is available today to give players some free cash for trying the new game. A tournament played on the new game begins today and ends Sunday. Wild Alaska is a 5 reel video slot with 20 pay lines. Players can bet from $.03 to $1.00 per line or play for free. There’s a Free Spins symbol on its reels and when three of them appear a bonus round is triggered. The Arctic sky comes alive with the Northern Lights and all wins during the Free Spins round are multiplied by three. Like the rest of WinADay’s games, Wild Alaska can be played on computers, phones and tablets. Like most of the slots games at the instant play casino, the new Wild Alaska is tied to the site-wide progressive jackpot. In this game, hitting five Polar Bear symbols wins the jackpot which is currently nearly a record-breaking quarter million dollars. With this new game following the launch of the new Gladiator Games last month, and Fluffy Paws just before that, WinADay now has 35 completely unique casino games that aren’t available at any other online casino. This month Gladiator Games is the Game of the Month; players that play the new Roman-themed game this month will be entered in a month-end draw for $500. A product of Slotland Entertainment S.A., WinADay Casino is a whimsical instant-play Flash casino offering unique free and real-money slot machines and card games that are available only at WinADay. Most of the one-of-a-kind games are tied to one progressive jackpot. Generous deposit bonuses, game-of-the-month bonuses, daily random draws bonuses and frequent six-figure progressive jackpot wins have made this casino popular around the world.